Soybeans have long been featured as the most versatile agricultural product in the world. While most soybean production ends up as components for animal feeds, a notable and growing percentage of the product can be found on retailer shelves in an amazing variety of products or in industrial applications that most would never have imagined. While modern technology has expanded the use of soybean components to a great number of non-food related products such as pharmaceuticals, auto parts, and low-VOC paints, food producers continue to find more uses for this most environmentally friendly and renewable resource. Today, 75,000,000 acres of U.S. farmland land are used for growing soybeans. Soybeans contain all 8 amino acids, all of which are essential for human nutrition. The soybean has been around for centuries. 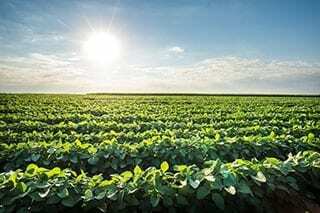 According to the Iowa State University Department of Agronomy, the first users and domesticators of the soybean were believed to be the Chinese in the northeast part of the country, sometime around the 11th Century. Soybeans were first brought to the United States from China by Samuel Bowen in 1765. The United States leads the world in soybean production at approximately 32% of the total global output. China is ranked fourth. Soy lecithin, a nutritional component of soy oil, was first discovered by a French scientist named Maurice Gobley in 1850. He named it “lekythos” a Greek translation for egg yolks. Soy lecithin contains choline, essential to all living cells and is, in fact, a component of live cell structures. Soy oil is the basis for low-VOC (volatile organic compound) BioStripe® Striping Paints used in parking lots and paved roads. With the elimination of harmful emissions and biodegradability, BioStripe® has been adopted by universities, public park systems and other eco-conscious organizations to line and stripe parking lots, pathways and roads. Soybeans are 18% oil and 38% protein. Most baked breads, cookies, crackers, pies and cakes contain soy oil. Soy oil can be converted to biodiesel fuel with a process called “transesterification”. This eco-friendly fuel has proven to burn cleaner than traditional petroleum-based fuels. Soybeans and newspaper are combined to produce renewable building materials known as biocomposites. Soybean-based products are frequently used in construction as fuel and other building supplies. Soy products are used in carpet fabrication, furniture coverings and auto upholstery. Soy oil can be a cleansing agent as well. The oil releases a solvent that has been used to remove oil from shorelines after spills. The solvents can also be found in many industrial cleansers. One acre of soybeans converts to 40,000 servings of tofu or 2,500 gallons of soy milk. Soy-based oils are used as lubricants and can withstand higher temperatures that of petroleum-based oils. Elevators in the Statue of Liberty are lubricated by soybean oil. Soy crayons are non-toxic and safer for children. The automotive industry is implementing the use of eco-friendly, soy-based body parts and lubricants to go along with upholstery and carpets. Soy foams are employed in refrigeration, insulation and even shoes. Derived from natural soybean oil, BioStripe® traffic paint and BioSealcoat® asphalt sealer help support farmers and have earned recognition from a variety of soybean councils and associations. Click here to learn more! Do you have interesting facts to add to the 20 listed above? Share your facts in the comments below!